A medium sized evergreen tree harvested mostly these days from Sri Lanka. The inner bark is beaten into long lengths which then curl on drying and are sold either in sticks or powdered. A popular spice widely used for cooking cakes, desserts, spicy sweets and teas. It is said to stop vomiting, relieve flatulence and diarrhoea. It is considered a 'warming' spice used to fend off colds. Some studies have shown that cinnamon may help regulate blood sugar. An old Norfolk remedy for dysentry was cinnamon powder in warm milk. 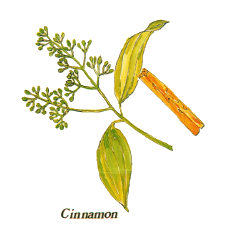 In ancient Greece cinnamon was used as a cure for bronchitis. The romans believed the fragrance was sacred. Pliny The Elder wrote that 350g of cinnamon was equal in value to over 5kg of silver. In the middle ages arab traders brought the spice to Eygypt where it was bought by Venetian traders who then traded it in Europe. The Crusaders brought cinnamon to England in the twelth century, it was then mainly used by the wealthier monasteries and Royal households.